There is no single name to describe them precisely. But they are a favourite condiment for giving an edge to food in most countries in the world. Known as Achar in North India, Achcharu in Sri Lanka, Urukaiin Tamil Nadu, chutney or pickle, they differ in taste and therefore cannot be put in one category. They are an essential part of the menu but are never part of the main menu. Pickles of some kind or the other have been part of cuisines for 4,000 years as can be gleaned from history. They also give us hints about cross-cultural connections. Cucumbers were taken from India to the Tigris river valley in Iraq in 2030 BC to be pickled. Cucumbers have been a part of pickling down the ages, up until today. And this is true of all countries. The method of pickling and the ingredients used in pickles have however changed. They also differ between South Asian, South-East Asian and European countries. The difference lies in the principle ingredients used as well as the method of preservation. Basically, vinegar, salt and oil are used for preservation. In India, oil is a popular medium. With tastes ranging from sweet, sour, bitter, pungent, salty and spicy, the range of pickles available the world over is amazing. According to the New York Food Museum Pickle History Timeline, 5,200,000 pounds of pickles are consumed annually in the United States alone, with an average of nine pounds per person. A Pickle Day is celebrated in autumn since 2001. Though a specific day is not earmarked for the pickle in the Indian sub-continent and South-east Asia, the importance of the condiment is undeniable here. Indian influence across countries is perceptible. Achar is a vegetable pickle in Indonesia, Malaysia, Singapore and Brunei, and is related to the Indian Achar. The Atchara of Philippines is a side dish often served with fried or grilled foods. The Chinese have an interesting method of preserving vegetables- calledZha Cai­. Here the vegetables are brined or salted. A simple Chinese meal of rice would have pickled vegetables – Yanlu or Yanzhi and also pickled cabbage- Pozi. Thai pickles are called Pat gat dong. They are strikingly similar to the Chinese version of pickled cabbage in vinegar, salt, and sugar. The Korean Kimchi is a fermented or pickled cabbage served with meals. The Japanese pickle Gari or pickled ginger often accompanies a sushi, Then there is the very popular salted pickle,Shiozuke. Misozuke pickles are made using Miso or fermented soybean paste. The Nukazuke, is made from rice bran. In India, the names are as varied as the taste. Famous throughout India is the Achar. The pickle is known by different names in different regions. 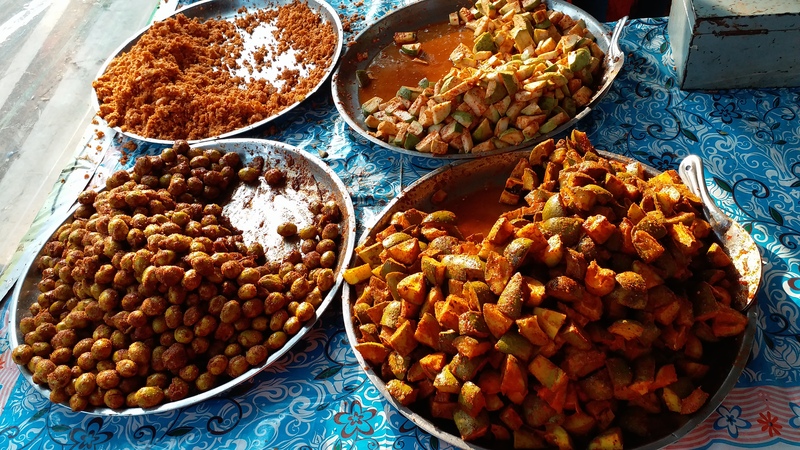 In Kannada it is known asUppinakaayi, in Telugu Pachadi, in Tamil Urukai, in Malayalam it is known as Uppillittuthu, in Marathi it is Loncha, and in Gujarati it is Athanu..
Achar is a popular dish in Pakistan, Nepal, and Bangladesh. With the use of a wide variety of vegetables and fruits, meat or fish, the thread that links all these together is the method of preserving. Pickles are mostly prepared in the summer as the hot sun aids in the preparation. The ingredients are matured by exposing them to the hot sun for a few weeks. The salt, spices and oil are used as preservatives. It is believed that the word Achar is Persian in origin and means meats or fruits, preserved in salt, vinegar, honey, or syrup. During colonial rule Achar got noticed through various writings. The word ‘pickle’ itself is said to be from the Dutch word- Pekel, meaning brine. The Kannada text Lingapurana of Gurulinga Desika (1594 CE) describes fifty kinds of pickles. The 17th-century Śivatattvaratnākara, an Encyclopedia of ancient Indian lore of Basavarāja, King of Keladi, also mentions pickles. Colonial times also witnessed a wide mobility of people of different languages and cultures moving across the globe and settling down in different locations. The cultures of their original habitats were transported and among those transported thus were food and food processing methods like pickling. The Sri Lankan ‘Achcharu’ is supposed to be of Malay origin and is also a part of everyday vocabulary as a word for a concoction, a mixture or a mess. Over time, the ‘Achcharu’ as well as the ‘rice pullers’ became synonymous with any “rice and curry” meal. Rice puller is a term to mean that the pickle induces one to partake a few more helpings of rice. The Sambolsof Sri Lanka are also rice pullers and have their unique taste.Pol Sambol is a mixture of lightly pounded or grinded scraped or desiccated coconut, dried chilli, salt, onion and Maldive dried fish. Then there is the Lunu miris or Kata sambol. These ‘rice pullers’ show a variety of influences including those of Moorish traders, the Portuguese, Dutch, English, Malays, Arabs and also various communities from of India. Pickles are necessary for travelers and sailors and have been widely used in voyages from the earliest times.